Posted on May 22, 2015	by Katy K.
This is the last of the Cybils Speculative Fiction for Young Adults 2014 Finalists, and another one that I would probably not have picked up otherwise. It’s the sequel to When We Wake, which I have not read. Though I was able to follow the action just fine anyway, if this premise sounds good, you’d probably want to star with that one. While We Run by Karen Healey. Little, Brown, 2014. The year is 2127. Abdi Taalib, originally from Somalia, came to Australia with the promise of a full scholarship for his singing. Things went horribly wrong with that in the previous book, and now he and his girlfriend Tegan (who was killed and frozen in 2027 and revived in the first book) both have implants in their heads that allow their sadistic controllers to cause them horrible, invisible pain any time they resist. They’re forced to put on cheerful public concerts to raise money for a cryogenic space ship program. This plans to deal with the growing environmental and refugee crisis by cryogenically freezing a few rich people who can pay for their own passage and lots of refugees who will work for the rich people in exchange for free passage and a chance for life on a new planet. 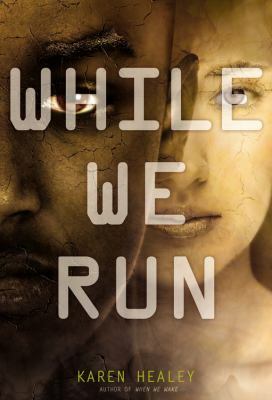 The problems with this plan are legion – Abdi and Tegan are most concerned about the slave conditions of the refugees, as well as the complete lack of concern for anyone who might be stuck back on Earth. Unknown to Abdi, there are lots of factions who see through Tegan’s brilliant smiles and are trying to rescue her in a movement called Save Tegan. But escape will not be easy, and even if they can escape, those factions have aims of their own which will probably not align with Abdi and Tegan’s. What will they owe their rescuers? Once again, I was impressed with the Cybils team’s choice in this book. There’s a lot of action and excitement, but also introspection as Abdi examines his own goals and motivations. That definitely added to my enjoyment as I really dislike it when the action moves so quickly that we never get to know the characters. The cast is wonderfully diverse, with characters from several different continents, religious persuasions, and gender orientations, including a trans woman. The dystopian future setting isn’t one of my favorites, but I’m in the minority on that, especially among teen readers. I especially appreciated that the evil future government is a believable progression from issues that face Australia (and many other countries) today. The cryogenics/space travel adds a welcome hard s/f aspect (Noggin had a softer take on the cryogenics topic.) I genuinely enjoyed getting to know Abdi and Tegan and cared about their cause. There’s quite a bit of violence and some almost-intimate situations that would make me feel more comfortable giving this to high schoolers and up, but middle schoolers who are already reading the popular teen dystopias won’t really find any content more objectionable than what’s in those books. This is highly recommended. I was unable to tell if there will be a sequel to this book or not – right now, it looks like it’s a finished duology, though the story could certainly be continued. This entry was posted in Books and tagged award winners, Cybils, diversity, dystopia, teen science fiction. Bookmark the permalink.